Meredith, it looks great! What a nice start! So you're going to start over on another piece of fabric now? What did you order? Thanks Christina! I'm not sure what fabric I'm getting! 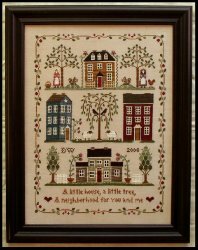 I live n NJ and order out of The Strawberry Sampler - a cross stitch store in PA. So, I've requested a 32 count over dyed linen. Something a little darker than what I was using. I'm hoping to get it by Friday because we are actually away all next week on vacation and I'd love to work on it some then. 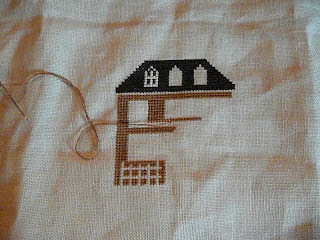 I may finish the one house I started and turn it into something smaller because I do hate to lose all that work...Have a good day! You have a great start. I am sorry you are not enjoying your fabric, I hope the substitute fabric will be better for you.